Simple Scan is a great app and there’s a lot of love for it. It’s one of those reliable, indispensable tools that it would be hard to live without. Just because it’s great doesn’t mean that it can’t be improved, of course, and it was recently suggested that I take a look at its design. Most of the improvements can be described as refinements. Right now there are a bunch of operations which can be a bit tricky to find, or which aren’t as obvious as they could be. There are also a few actions that are well and truly buried! The primary changes are the introduction of a sidebar for selecting a page and the use of an action bar at the bottom for performing page actions. This makes it much clearer which page is selected, which is important when you want to perform edits. It also helps to communicate the purpose of the edit buttons – right now crop and rotate are a little ambiguous, largely due to their placement. There are some other smaller improvements. The scan button now communicates the image/text and single page/document feeder modes, which means that you don’t have to dig into the UI to find out what will happen when you click the button. Some options, like reorder pages, have been rescued from the relative obscurity of the app menu. 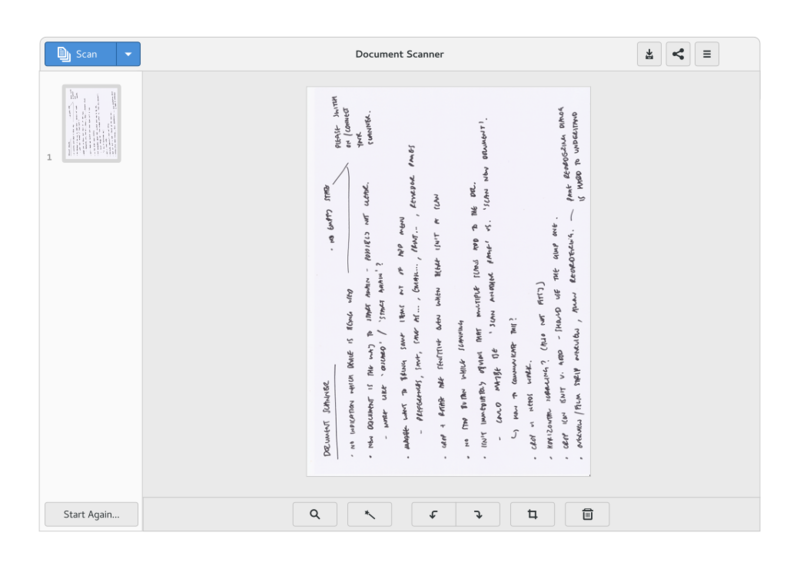 The current “new document” action has been rebranded as “start again”, in order to communicate that it’s how you clear the current scan as well as start a new one. This uses an experimental approach to the brightness and contrast settings here. To be able to use these, someone really needs feedback on what the different settings look like in practice. To enable this, I’ve sketched out a test scan mode which produces samples using a range of settings. 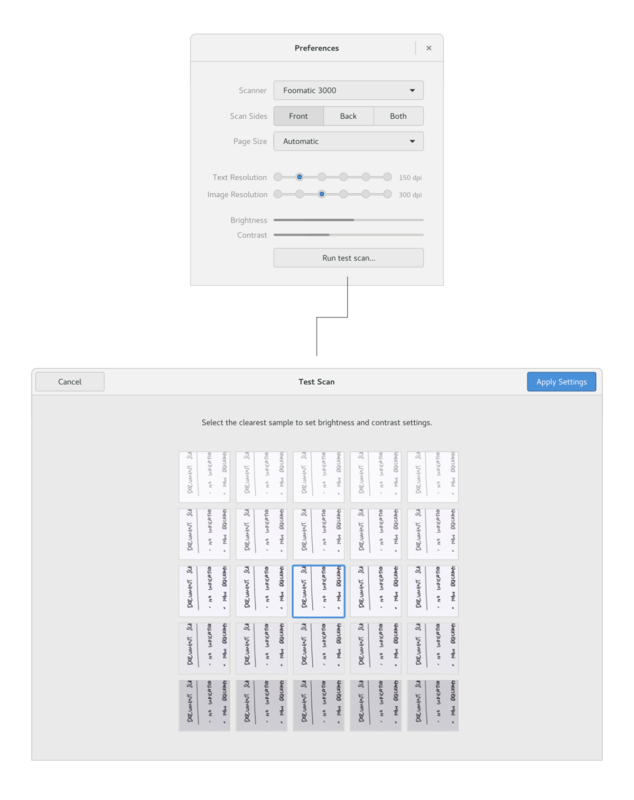 This allows the user to specify the settings by selecting the best sample. Observant readers will notice a crop of new controls for features that don’t currently exist. 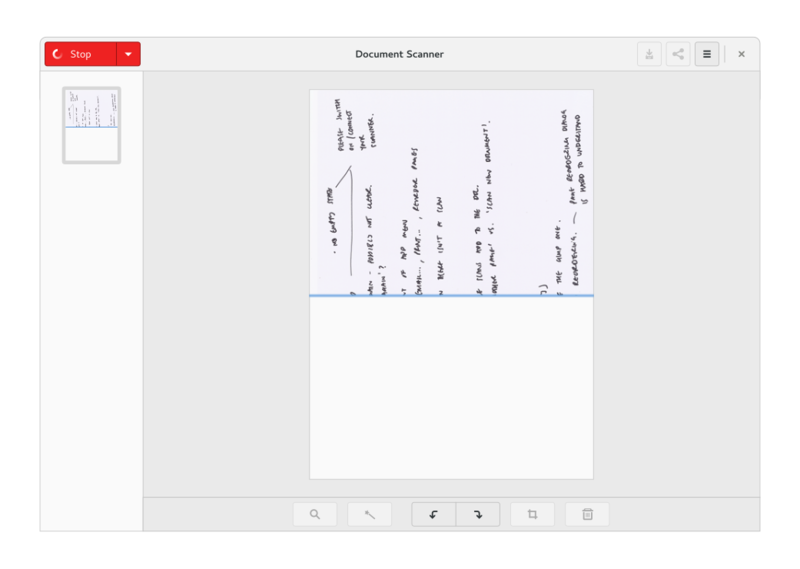 This includes OCR text reading and editing, a zoom control, and a magic enhancement feature. These are mostly placeholders for features that Robert Ancell, the Simple Scan maintainer, would like to add at some point in the future. As far as I’m aware, no one is lined up to implement these changes, so if anyone fancies taking a shot at them, that would be great. The initial changes are described in a couple of bug reports. For more details, you can also see the full mockups in all their warty glory. Why do the mockup always look nicer than the actual implementation? It’s a theme thing only? Btw, automatic enhancement and OCR would be awesome features. That radio button-like or slider-like widget in the settings, is it implemented in GTK/Adwaita? It doesn’t exist yet, and I’m still not 100% sure it’s something we need. It seems like an interesting idea to explore though! Before reading, I thought “start again” was for the current selected page. It’s ambiguous ! thanks for your work. looks great. I have the problem that I have to be su in order to be able to scan sth (Fedora 25). Does anybody has an hint for me? Instead of “Start again” which is confusing use “New” button and if one document already opened then create a tab, just like in Nautilus file manager. Looks good, but I think the resolution settings need a bit more attention. It is not clear that the value behind it indicates the current selected value or the maximum possible, in addition to the lack of a step size indication and no way to know the minimum resolution. At least knowing what is selected and what is the max is crucial info if you ask me. 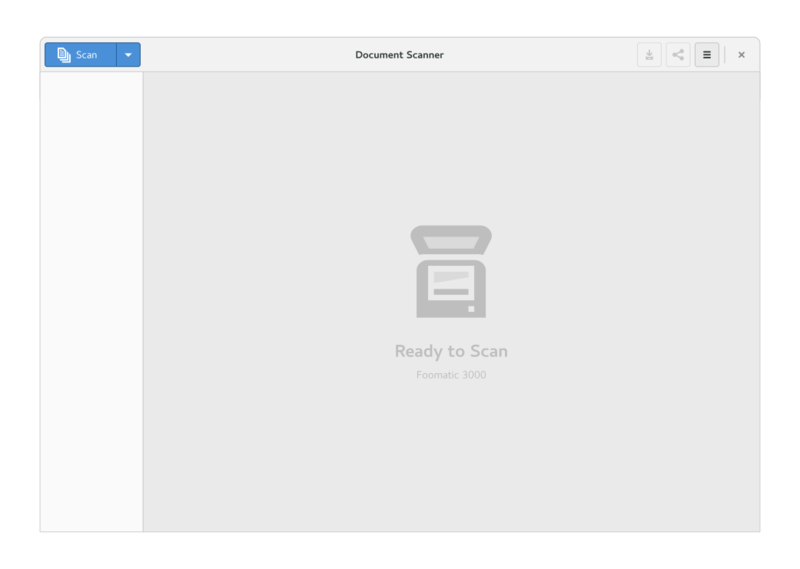 It would be nice to have a “scan and print” function built right into simple scan. This is actually a surprisingly common use case. I’d love it if there would be a way to scan a stack of pages, and then a way to create multiple documents/PDFs out of subsets of the pages. Right now I’m forced to go back and forth to scan each document separately.